This is why I always sit at the back. My sympathies to her family. I think it may be time to revisit seat belts. Looking at the photos on Twitter it looks like she was thrown through the front windshield. Had she been buckled in.... I bet the driver had a seat belt. 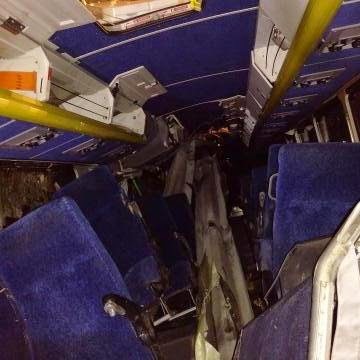 I don't think there's any way to really tell by where you sit on a GO bus how you will survive a collision, especially when a chunk of guardrail slices through the bus. As for beat belts, I'm all for added safety measures. But that debate aside, I really feel for this woman's family. "What ifs" can be left for the brass at Metrolinx to ponder. "What ifs" don't help the pain her family will go through. In no way am I minimizing what happened by focusing on how it could not have happened. What ifs usually help prevent another death. Glad to know you're on board with seat belts.